Gross, S(amuel) D(avid)., M. D., LL. D., 1805-1884. Philadelphia : Lindsay and Blakiston, 1868. Description : front., [i]-viii p.,  l., 1-96 p. ; ill., port., 23.7 cm. Photograph : frontispiece, mounted albumen. Subject : Medical Biography — Valentine Mott, 1785-1865. Green buckram, ornamental blind stamping on covers, gold stamped spine. 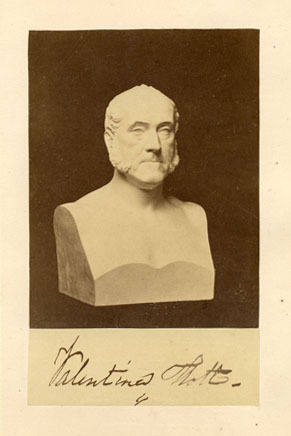 Frontispiece photo depicts a marble bust of Mott with his signature below. Sculptor : John Quincy Adams Ward, 1830-1910. Photo size : 69 x 113 mm. Previous owner's bookplate : R(ichard) H(andfield) Titherington [1861-1935]. Mott was a pupil of Astley Cooper and a pioneer in vascular surgery.